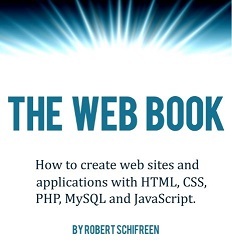 The Web Book is a free book that tells you everything you need to know in order to create a home or business Web site from scratch. It covers everything from registering a domain name and renting some hosting space, to creating your first HTML page, to building full online database applications with PHP and MySQL. It also tells you how to market and promote your site, and how to make money from it. Robert Schifreen is a former UK-based computer hacker and magazine editor, and the founder of IT security awareness training programme SecuritySmart.co.uk. He is also a professional writer and trainer with 20 years of experience writing books and developing software.